I was lucky to meet Angus two months back while going to a tribal village. His love for Bengali food is infectious. Please read the article here telegraphindia.com . I am now taking him to hidden food treasures of Kolkata. He has made an amazing documentary on street food of Kolkata. Without any doubt it is the best I have ever seen in this category - it is unique in its own way. If you want a copy, you can contact me.He is also writing a book on street foods of Kolkata. According to him in Kolkata you get the best street food anywhere in the world taking everything into consideration. 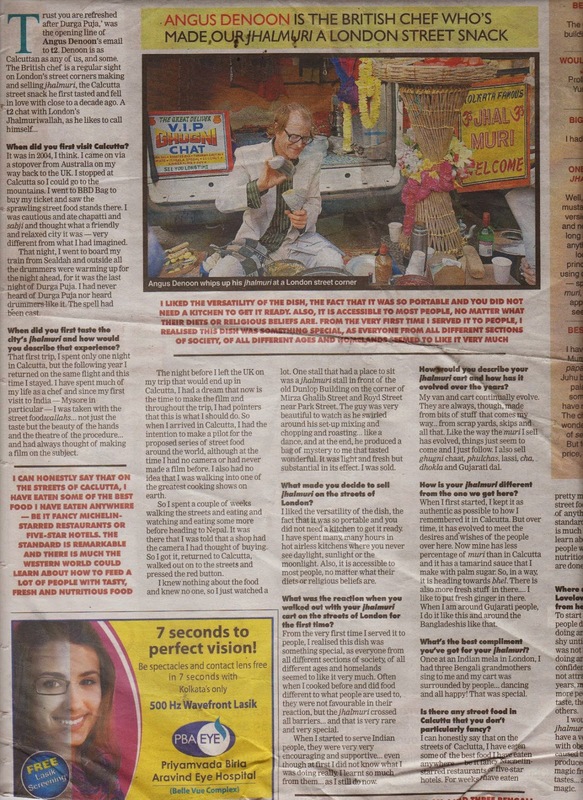 click the link for the documentary in Fox Travel and Living in "Eat Street"
A humble newspaper cone of jhalmuri from the streets of Calcutta changed the life of Angus Denoon. Selling his house, the Englishman moved into a van from which he started selling jhalmuri across London, wrote a book, and made a film. Denoon tells t2 how it all started and why Calcutta continues to fascinate him. How did your love affair with Calcutta street food begin? I came back for longer the next year. I noticed the hand movements of the street-food sellers — like a dance, fluid and precise, with no wasted energy. The way they run their kitchens, their set-up, with really efficient ways of chopping... was totally inspiring. I loved it. Which street food did you try first? A puri breakfast. I was initially sceptical... but you know what happens when you eat really good food. You lose the worry and suddenly the pleasure takes over. But how did you end up selling Calcutta street food in England? I started making it at a Friday market in Devon — a hippie market but also with lots of old people, conservative customers. Everyone, from the hippies to the conservatives, loved it. I continued simply because of their reaction! Rich, poor, Jamaicans, Africans, Chinese, English — the whole cross-section of society. When they see it being made, they’re like little babies with their eyes wide open, and when they taste it, they’re like ‘WOW!’ Never before have I seen that reaction for a dish. One is always adapting, just like with the muri. I’ve now got better sources for my ingredients — Wembley, Tooting, Southall, you learn where is good for what. I can chop very fast now, I have a little way of cutting a cucumber and a tomato and I know how to play the crowd. So you’re a performer too? Oh yes. Like all these guys [the street-food sellers of Calcutta]. They’re doing little shows. I’ve watched the customers — maybe they eat from the same man almost every day, but when it’s being made, they watch. Eating street food is a private but public experience. You’re on the level playing field of the streets, where everyone, if they’ve got a little money, can have it. That’s why Calcutta is so incredible. When you’re on the street, being bombarded with traffic, noise, people, and you put that food in your mouth, you are transported. You get re-energised, you’re given this boost and then off you go. I think that’s why Calcutta is special. It’s a hard city in many ways — the pollution, the traffic. But this? It’s affordable, good, fresh food. It doesn’t get much better than this! The taste of the food doesn’t have to correlate with the price — that’s the most extraordinary thing for me. What about your book and film? The book is a street-food guide for tourists but I want to re-do it. I’ve seen that you can adapt this style of cooking to anything... I want to see how you can adapt it to western cooking. As for the film, I came to Calcutta and filmed for a month. I had never used a camera before and knew nothing — I just filmed. Back in England, some filmmaker friends taught me how to edit. That’s how the film happened. I would like my film to be an interactive experience — sounds of Calcutta playing in the background and the film broken up into a day in Calcutta. So, start by passing cups of chai around, pause and put a spotlight on, for example, ghugni being made. Then pass that around, the film begins again and so on. You said Londoners were initially wary — has that changed? People are opening up. The whole street food thing in London is really taking off... it’s become a bit of a fad. So that’s good, although obviously a fad has its downside. I love batata puri. And chhatu — both in the solid form with onion and green chilli as well as the paste with water. I’ve just bought three packs, breakfast is sorted for ages! There were three old ladies, tiny and grey-haired, who started singing and clapping as I went about making the muri. Suddenly there were hundreds of people around me, singing and clapping! It was amazing — I got choked up. The way people react is the main thing and when you see that happen, it’s very powerful. When you’re working in the kitchen of a restaurant, no matter how good the food is or how much you’re paid, you just don’t get to see that. When I look at my accounts, I don’t really make much, and I work very hard. It’s a labour of love, but you keep going... The food is so good, and that’s when you think you need to keep it going, somehow. 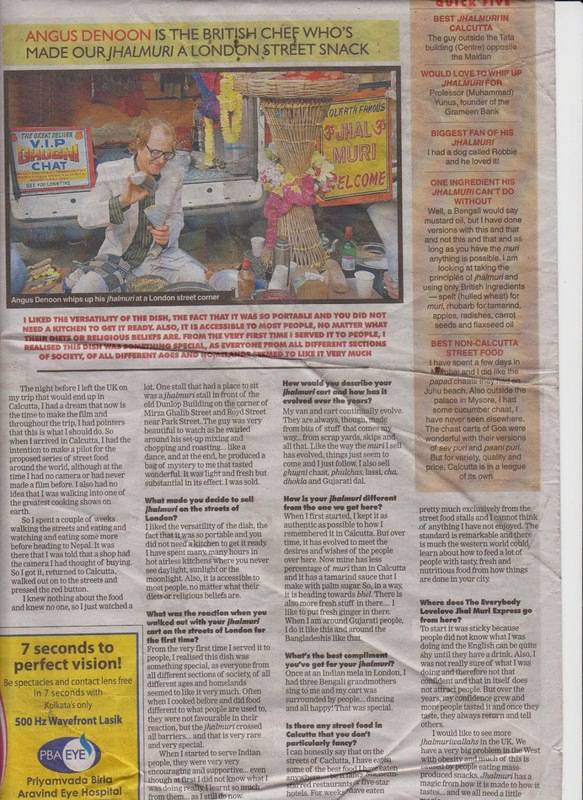 Angus Denoon is the british chef who’s made our jhalmuri a London street snack The Telegraph 23.10.13. When did you first visit Calcutta? It was in 2004, I think. I came on via a stopover from Australia on my way back to the UK. I stopped at Calcutta so I could go to the mountains. I went to BBD Bag to buy my ticket and saw the sprawling street food stands there. I was cautious and ate chapatti andsabji and thought what a friendly and relaxed city it was — very different from what I had imagined. That night, I went to board my train from Sealdah and outside all the drummers were warming up for the night ahead, for it was the last night of Durga Puja. I had never heard of Durga Puja nor heard drummers like it. The spell had been cast. When did you first taste the city’s jhalmuri and how would you describe that experience? That first trip, I spent only one night in Calcutta, but the following year I returned on the same flight and this time I stayed. I have spent much of my life as a chef and since my first visit to India — Mysore in particular — I was taken with the street foodwallahs... not just the taste but the beauty of the hands and the theatre of the procedure... and had always thought of making a film on the subject. The night before I left the UK on my trip that would end up in Calcutta, I had a dream that now is the time to make the film and throughout the trip, I had pointers that this is what I should do. So when I arrived in Calcutta, I had the intention to make a pilot for the proposed series of street food around the world, although at the time I had no camera or had never made a film before. I also had no idea that I was walking into one of the greatest cooking shows on earth. So I spent a couple of weeks walking the streets and eating and watching and eating some more before heading to Nepal. It was there that I was told that a shop had the camera I had thought of buying. So I got it, returned to Calcutta, walked out on to the streets and pressed the red button. I knew nothing about the food and knew no one, so I just watched a lot. One stall that had a place to sit was a jhalmuri stall in front of the old Dunlop Building on the corner of Mirza Ghalib Street and Royd Street near Park Street. The guy was very beautiful to watch as he swirled around his set-up mixing and chopping and roasting... like a dance, and at the end, he produced a bag of mystery to me that tasted wonderful. It was light and fresh but substantial in its effect. I was sold. What made you decide to sell jhalmuri on the streets of London? I liked the versatility of the dish, the fact that it was so portable and you did not need a kitchen to get it ready. I have spent many, many hours in hot airless kitchens where you never see daylight, sunlight or the moonlight. Also, it is accessible to most people, no matter what their diets or religious beliefs are. What was the reaction when you walked out with your jhalmuri cart on the streets of London for the first time? From the very first time I served it to people, I realised this dish was something special, as everyone from all different sections of society, of all different ages and homelands seemed to like it very much. Often when I cooked before and did food different to what people are used to, they were not favourable in their reaction, but the jhalmuri crossed all barriers... and that is very rare and very special. When I started to serve Indian people, they were very very encouraging and supportive... even though at first I did not know what I was doing really. I learnt so much from them... as I still do now. How would you describe your jhalmuri cart and how has it evolved over the years? My van and cart continually evolve. They are always, though, made from bits of stuff that comes my way... from scrap yards, skips and all that. Like the way the muri I sell has evolved, things just seem to come and I just follow. I also sell ghugni chaat, phulchas, lassi, cha, dhokla and Gujarati dal. How is your jhalmuri different from the one we get here? When I first started, I kept it as authentic as possible to how I remembered it in Calcutta. But over time, it has evolved to meet the desires and wishes of the people over here. Now mine has less percentage of muri than in Calcutta and it has a tamarind sauce that I make with palm sugar. So, in a way, it is heading towards bhel. There is also more fresh stuff in there.... I like to put fresh ginger in there. When I am around Gujarati people, I do it like this and around the Bangladeshis like that. What’s the best compliment you’ve got for your jhalmuri? Once at an Indian mela in London, I had three Bengali grandmothers sing to me and my cart was surrounded by people... dancing and all happy! That was special. Is there any street food in Calcutta that you don’t particularly fancy? I can honestly say that on the streets of Calcutta, I have eaten some of the best food I have eaten anywhere — be it fancy Michelin-starred restaurants or five-star hotels. For weeks I have eaten pretty much exclusively from the street food stalls and I cannot think of anything I have not enjoyed. The standard is remarkable and there is much the western world could learn about how to feed a lot of people with tasty, fresh and nutritious food from how things are done in your city. Where does The Everybody Lovelove Jhal Muri Express go from here? To start it was sticky because people did not know what I was doing and the English can be quite shy until they have a drink. Also, I was not really sure of what I was doing and therefore not that confident and that in itself does not attract people. But over the years, my confidence grew and more people tasted it and once they taste, they always return and tell others. I would like to see more jhalmuriwallahs in the UK. We have a very big problem in the West with obesity and much of this is caused by people eating mass-produced snacks.Jhalmuri has a magic from how it is made to how it tastes... and we all need a little magic. i had a dog called Robbie and he loved it!